The other day, an acquaintance asked me how I was doing. 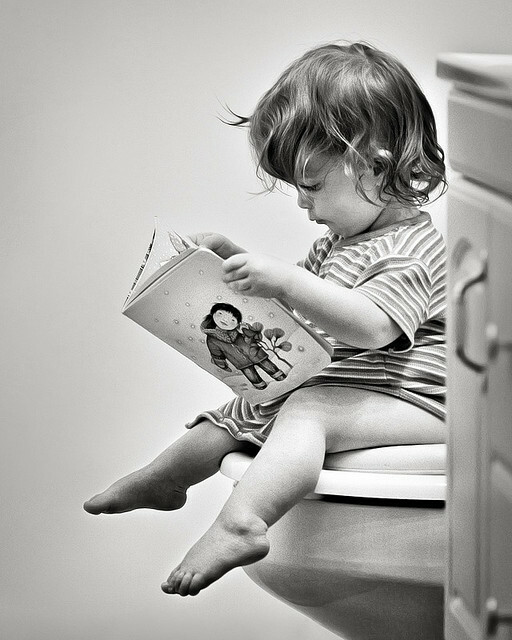 I found myself unloading (no pun intended) about the trials and tribulations of potty training for several minutes. I could hear myself rattle on and on about potty training…like I was floating above myself watching this unfold but couldn’t. manage. to. stop. The backstory: My daughter recently started a new preschool that requires that kids be potty trained. When I signed her up for the school earlier this year, September seemed like an eternity away — of course she’ll be trained by then, I rationalized. Of course, as life would have it, the more Nice Tall Guy and I “encouraged” our daughter to use the toilet, the more she clung to her diapered ways. Transitions take time. They are a process. Be patient. Never underestimate the power of a new environment to stimulate learning and change. (For those who are curious, about a day or two after my daughter started her new preschool, she was potty trained – minus a few accidents, most still at home!) It’s true, right? When we feel stuck or uninspired, there’s a lot that changing our view can do to stimulate our brains or change our perspectives. So whatever version of a potty training challenge you may be facing in your life, I raise my glass to you in solidarity and understanding. And I hope yours doesn’t involve cleaning up actual human poop. But if it does, I would advise you to fill your glass up with wine. And take a deep breath. Posted in career, Parenting, Uncategorized. Tagged career, kids, learning, parenting. It just goes to show that learning can be achieved from every day incidents, whether big or small! So true! And sometimes the biggest learning comes from the mostly seemingly small and everyday stuff. Thanks for your comment! Did this ring a memory bell for me! It brought back visions of sitting on the kitchen floor, wearing an apron with pockets full of treats, a potty that played “Tinkle Tinkle Little Star” when used, and a copy of “Toilet Training In Less Than A Day”. My little guy looked at me like I was nuts. Needless to say, it didn’t work. But it wasn’t long after that day that music came from that little potty…when he was good and ready. One mom's search for meaning in the madness. writer. editor. curious + common.